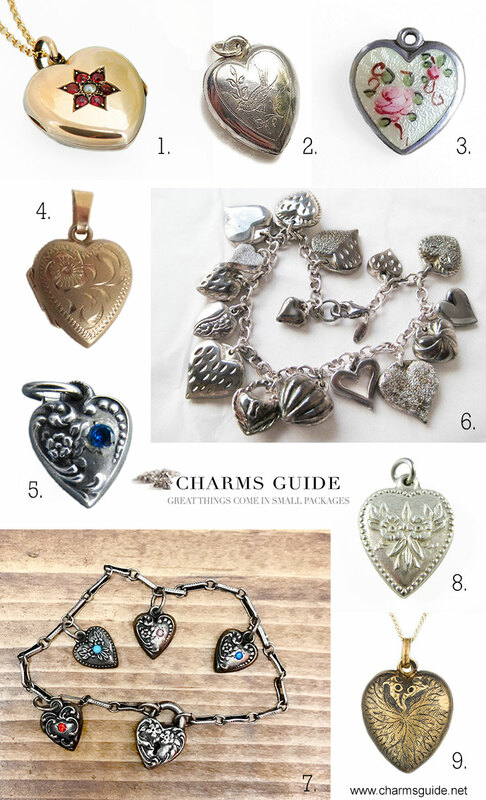 Today we are going to talk about one of my favorite types of charms: puffy hearts. Puffy (or puffed) hearts are also known as répoussé hearts and first became popular in the late 1800s. They stayed in vogue until around 1910 when for some reason they lost their popularity, only to regain it in the 1930s – 1950s. Today, vintage puffy hearts are much sought after jewelry pieces. They are priced accordingly, and you can expect to pay quite a bit for a pristine Victorian heart charm or an enameled heart from the 1940s in perfect condition. Unfortunately, there are many fakes out there, some so good that there are times when even the experts are fooled, so if you are shopping for a vintage puffy heart bracelet, it pays to do a little bit of reading and research first. Puffy hearts have hollow cores and are made either from two halves put together, or one piece of metal folded over. The designs are either répoussé (a.k.a. 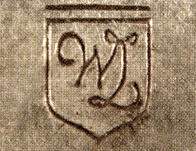 repoussage), a technique where the design has been hammered into the metal on the reverse, the side that eventually ends up as the interior of the heart, and shows up in relief on the front. or chasing , where the design is impressed into the front of the heart. Victorian puffy hearts were mostly made from silver, sometimes with beaded edges, gypsy set (flush with the surface of the charm) with precious, semi-precious or glass stones (cabochons or rose cut) vitreous enameled – the “lucky color” turquoise was especially popular and these gorgeous charms are some of my favorites – and often beautifully engraved. They were hung on rigid bangles or substantial link chains with adorable heart and key padlock clasps. Puffy heart locket charms (and pendants) were also very popular, and held pictures or a piece of hair. Hearts from the 1930s and 40s are also usually made from silver (the other precious metals were used for products needed in the war), and in the 50s from silver or gold. They are most often hung on chain bracelets (thinner than the Victorian models), sometimes with heart padlocks, sometimes with other clasps. 1930s-50s hearts are often more “puffy” than the Victorian ones, and have glass or rhinestones, either gypsy set or simply glued in, are sometimes engraved (by hand or machine), and finished with vitreous or cold enamel and guilloché. The term guilloché is often used as a name for a certain style of enamel, but it is in fact the name of the process itself, and describes a pattern or design machine-carved into the metal and then covered with enamel. It is important to understand this distinction, because you will see many painted and enameled charms erroneously described as guilloché. If they don’t have that machine-cut pattern underneath the enameling, they are NOT guilloché. The machines used for this type of carving are not made anymore, and you won’t find any guilloché charms produced today. The most prolific charm designer in the 40s and 50s was Walter Lampl, whose catalog at one point consisted of over 750 charms. The charms came in huge variety of designs and were made from sterling silver and 14k gold, often set with pearls, precious and semi-precious stones. The “flower of the month” puffy heart charm series was (and is) extremely popular. Each charm features a guilloché background, enamel, a painted flower and the birthstone of the month set above the flower. The Lampl Company also made amazing movable charms, and the charm bracelets celebrities were given at the end of each episode of “This is your life”. He was also one of the few who hallmarked his charms, and they are easily identified. If you see WL in a shield (or the more obvious WALTER LAMPL, or LAMPL), you’re looking at a Walter Lampl charm. They are highly collectible and many sell for hundreds of dollars today. You can also find reproduction puffy hearts from the 70s and on, made with old molds (or molds created from old charms, or just plain copies) but these have little or no value from a collector’s standpoint (yet…). Having said that, there are many that are quite lovely and beautiful pieces of jewelry in their own right, and honest sellers will label them “repro”, “reproduction” or “vintage-style”. But if you are looking for vintage or antique pieces, it’s good to know that these are out there and be on the lookout for “antique” charms from the 1980s. If you are buying an entire assembled vintage charm bracelet, be sure to inspect each charm, as well as the chain, closely. While some of the charms may be antique, others may be repros. There is nothing wrong with that of course, as long as the seller is up front about it, and you don’t pay premium price for something that is misrepresented to you. How can you tell? As I mentioned earlier, it is not easy. But there are a few clues to look for: anything rhodium-plated is not vintage or antique. Also inspect the embossed designs closely. Victorian ones are crisper, more detailed and deeper than those from the 40s, and modern day reproductions are even less so. Also, many contemporary charms are treated with chemicals to give them that vintage tarnished look. Try scraping lightly with a fingernail, and if the tarnish comes off, it’s a sign that it’s not vintage. This is not a foolproof method however, since you can also tarnish silver with the help of eggs (thanks to the sulphur), which leaves no residue. When shopping online, make sure to communicate with the seller first. Ask for closeup images of both sides of the charm, and other details. Also see our post about Buying Vintage Jewelry Online. One good source for puffy hearts is Etsy, and we have put together some recent favorite finds here. Keep in mind that these are vintage and one of a kind items, so if one of them strikes your fancy, act fast! 1. 9k gold locket from the late 1800s set with faceted red garnets and a seed pearl in a flower shape. Victorian gold heart locket from Closet Gothic. 2. Ca 1910 silver puffy heart pendant charm with etched bird on the front. Antique sterling silver puffy heart bird pendant from Betsey’s Room. 3. Ca 1940’s Walter Lampl enamel heart charm with a rose and bud on the front and marked “Daddy 43” on the back, with the WL marking and Sterling. Walter Lampl charm from Bellas Silver Shop. 4. 10k rose gold puffy heart locket from the 20s – 60s. Puffy heart locket charm from Mushka Vintage. 5. Ca 1940’s tiny sterling répoussé puffy heart charm with forget me knots and scrolls and a faceted blue stone. Vintage Tiny Sterling 1940’s Puffy Heart Charm from Time To Fly Designs. 6. JCM Mauritius heart charm 925 sterling silver bracelet from Vintage Jewelry Alcove. 7. 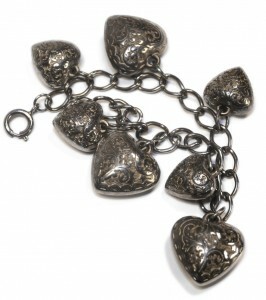 Sterling silver charm bracelet with four repousse puffy hearts with stones and a heart padlock clasp. Each piece is signed Sterling on the back. Puffy heart charm bracelet from Ms. Malena’s Vintage. 8. Vintage sterling silver puffy heart charm from Worldwide Oddities. 9. 14k gold Victorian heart pendant made in the Austro-Hungarian empire sometime between 1872-1922. Antique Heart Charm from Trademark Antiques. We will keep updating this product roundup as items are sold and new pieces become available. Please make sure to do your due diligence before purchasing any vintage jewelry online to make sure that it is authentic. This post contains affiliate links, and we will receive a small compensation if you make a purchase after clicking on such a link. So glad to have found this!! I have my mother’s “puffy hearts” charm bracelet. She told me that these charms were extremely popular when she was growing up (1930-1940) . They were exchanged among family and friends, and the giver had his/her name or initials engraved on the reverse, it’s an important part of my family’s past, and thank you!! How lucky you are to still have your Mother’s bracelet! I bet it’s absolutely beautiful, and of course priceless with all the history that goes with it. Thank you for sharing that!